Intel has just announced its new line of 8th generation Core processors with AMD Radeon RX Vega M discrete graphics at CES 2018, and to show off how powerful small PCs running these chips will be, it’s also released the Intel NUC 8 Enthusiast. Intel’s NUC (Next Unit of Computing) mini PCs have always been handy little showcases for Intel’s technology, and the new version is set to really impress us. Running on an Intel Core i7-8809G, which comes with an AMD Radeon RX Vega M graphics card, rather than just relying on integrated graphics, the Intel NUC 8 Enthusiast is set to be able to handle most modern games, as well as support 4K resolutions. 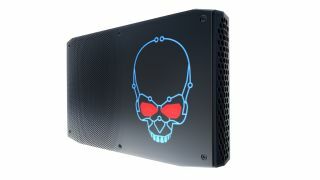 There will be two versions available: the NUC8i7HVK, which comes with Radeon RX Vega M GH graphics, which can be overclocked, and the NUC8i7HNK, which comes with the slightly less powerful Radeon RX Vega M GL GPU, and can’t be overclocked. Intel is advertising the NUC8i7HVK as being able to play VR games as well, so if you’re looking for a small PC for your living room that can handle VR, that could be a great choice. Both NUC devices, as with previous models, are barebones units, which means you need to install memory and storage yourself, but this does give you flexibility when configuring the new NUCs. They will both support up to 32GB of dual channel DDR4 RAM, and have two M.2 slots for storage. They also come with two rear Thunderbolt 3 ports, USB 3.1 ports and plenty of USB 3.0 connections as well. They also come with front and rear HDMI 2.0a ports that support 4K video at 60Hz and HDR, along with DisplayPort 1.3, and all video out ports will support HDCP 2.2. Audio is handled via HDMI and DisplayPort (with 7.1 surround sound), TOSLINK optical connection, or via 3.5mm jacks (there’s two, one at the front for headphones, and one at the back). All of this is packed into a 1.2 liter box made from metal and plastic with dimensions of 221 x 142 x 39mm, and it comes with a VESA mount for hiding it behind your TV or monitor. We don’t know what kind of prices Intel will be asking for, but we’ll let you know as soon as we’ve heard.